Fast High quality permanent repair that after 15 - 20 minutes, the repair area can be open to both vehicle and pedestrian traffic. Long Lasting Thermal bonding means that no cold joints are created, thus preventing water ingress and repair failures. A cold joint allows water between the old and new surface and once this water freezes it expands and causes the tarmac to separate and the repair to fail. Cost Effective Our repairs with rejuvenating process are expected to last up to ten times longer than the traditional methods, providing effective pothole maintenance. With cost effective prices the greatest ongoing savings can be made when preventative maintenance of cracks and holes is done at the same time as pothole repairs. No Disruption Disruption to car parks is kept to an absolute minimum so costly shutdowns are avoided. Compact mobile units means only small areas are closed off at any one time. 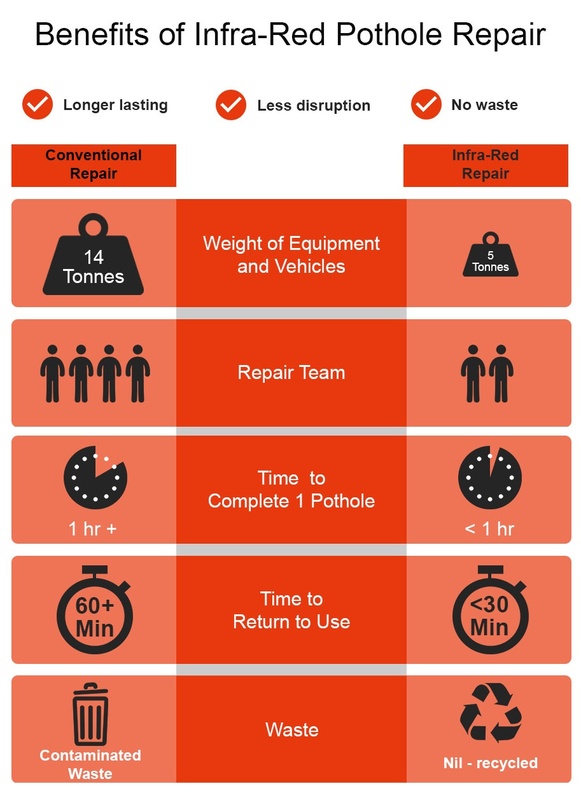 Minimal Environmental Impact Infrared pothole repairs leave 90% less of a carbon footprint on our environment when compared to the conventional cut, breakout and replace method of pothole repairs. No use of diamond cutting or pneumatic breakers and therefore no excessive noise or air pollution. We will guarantee our work and ensure that the hassles normally associated with finding a reliable contractor are no longer an issue. Infrared repair is the best option to avoid disruption and have an area back in use quickly.